Is SeaWorld safe for killer whale trainers? One year after the horrific death of a SeaWorld trainer, the popular Orlando, Fla. theme park is getting set to launch a new killer whale show with revamped safety measures. But critics say there isn't enough being done to prevent another tragedy. CBS News correspondent Whit Johnson reports the park announced it plans to allow trainers back in the water - something that hasn't happened since the attack on Dawn Brancheau last year. 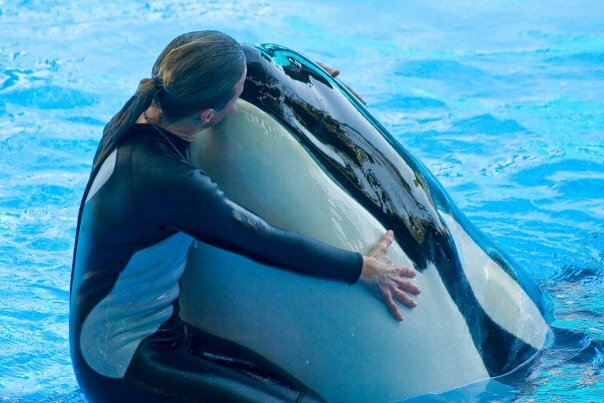 Brancheau, a 40-year-old trainer, was attacked and drowned by a 12-ton killer whale named Tillikum. Tillikum is still at SeaWorld, but is kept at a safe distance from the public and the trainers. Since Brancheau's death, trainers have been subject to a new set of rules. Johnson reported the days are over of high flying "rocket hops," in which trainers are propelled into the sky by the whale. In fact, even though they'll be going back in the water, it will only be during training sessions. Workers will also have access to safety bars, and pony tails must be wrapped into a tight bun. Chuck Tompkins, corporate curator of SeaWorld, said, "We've always said that we're gonna work to try and get back in the water. We're not there yet." No date has been set for in-water training, but critics the safety precautions still ignore the heart of the problem. John Jett, a former SeaWorld trainer, told CBS News, "They're certainly masking the issue that the whales are really bored. You deprive them of all the social stimulation, environmental stimulation and expect him to do well. You know, it seems to me to be a recipe for disaster." In April, Johnson said, SeaWorld plans to fight a number of safety violations that could keep killer whale trainers out of the water for good. SeaWorld and Brancheau's family, Johnson reported, are teaming up to create a foundation in her memory. Dr. Jeffrey Ventre, who spent four years as a trainer with SeaWorld's killer whales and knew Brancheau, said this is a "predictable response" from the company. "This is a multibillion dollar corporation that makes its money through the exploitation of orcas and trainers," he said on "The Early Show." "Trainers are grossly underpaid. And as Dr. Jett just mentioned in the previous segment, these animals are highly understimulated. Tillikum chose to pull Dawn into the water by her left arm, and it got ugly after that. So this is a predictable response. But I think the key point in history is going to start on April 25, when OSHA (Occupational Safety and Health Administration) takes a close look at the safety issues associated with swimming in the water with killer whales, and I think that's going to determine whether this will actually happen or not." Co-anchor Chris Wragge noted Ventre is a key witness in government hearings about SeaWorld. What does he plan to say about the industry? Ventre explained, "Well, first of all, Tillikum did a counterclockwise spin move using an arm bar and rolled Dawn into the water and killed her in probably just a couple of minutes. It really became a recovery operation soon after she got into the water. He broke her sternum; he bit off her left arm. She was scalped. She had a lot of internal bleeding. The posterior elements of three ribs were broken, and he simply wouldn't give her up. It took an additional 30 minutes just to pry his jaws open and get her out of him. And I think that these are the reasons why ... SeaWorld doesn't want to open these hearings up. Because the details are horrific." Ventre added, "I just wrote a paper with Dr. Jett that describes the increased mortality and morbidity associated with the whales themselves. For example, we now know that killer whales in captivity typically don't live to even 10 years once they enter that environment. We also know that they break their teeth on the horizontal steel bars that separate them for training sessions. And if you take a look at their teeth, this might be the reason why they're dying at such an early age."